This page contains a free tutorial on how to weave a plain-weave tubular band while sewing it to the edge of cloth. 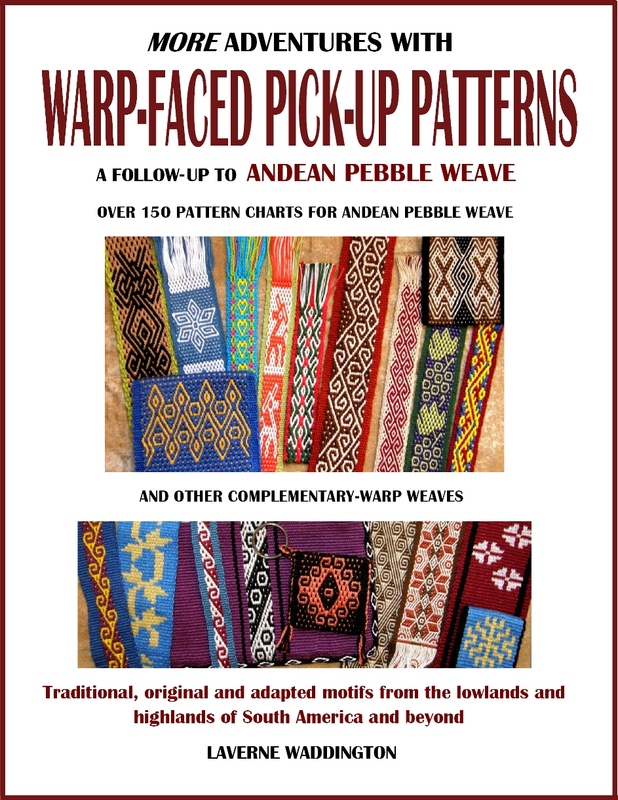 If, howvere, you would like to weave a traditional patterned tubular band that is used in the Andes to edge fabric, I have produced an e-book on this topic. The tube can be simultaneously woven and sewn as an edging without any previous knowledge of backstrap weaving. The warp is simple and does not use heddles. My e-book on the Eye-pattern Tubular Band is available on patternfish. It includes supplementary instructional video clips. 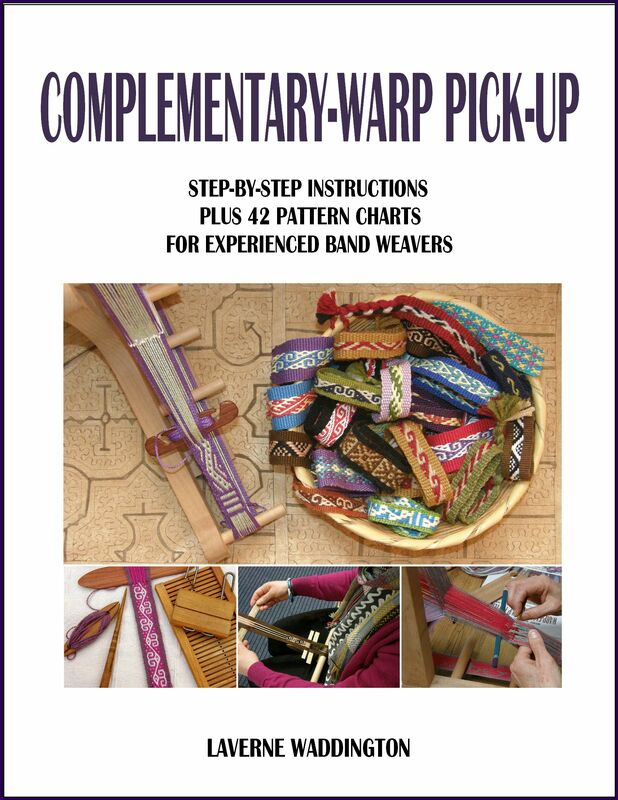 This tutorial assumes a basic knowledge of backstrap weaving…confidence with winding a figure-of-eight warp, string heddle making and the use of a shed loop. Narrow plain weave bands can be used to edge finished woven pieces either as a decorative accent or perhaps to hide less-than-perfect selvedges. Here in the Bolivian highlands weavers use them to edge their chuspas (coca leaf bags) and other woven pieces of fabric. I have read that the bands applied to edges can stop the problem of curling that can occur when high twist yarn is used to weave. My Guarani weaver friend in lowland Bolivia where I live also uses these bands to cover and stabilize the raw edges of a woven piece. The cut edge of this weaving is cut further and shaped and then covered with a woven tubular band..
My Guarani friend edges the entire cell phone pouch with a tubular band rather than just the flap as I have done. Her band is used to decorate and strengthen the edges. In coastal Ecuador my weaving teachers edge their cotton saddle bags with these kinds of bands using a homemade wooden rigid heddle with which to weave them. 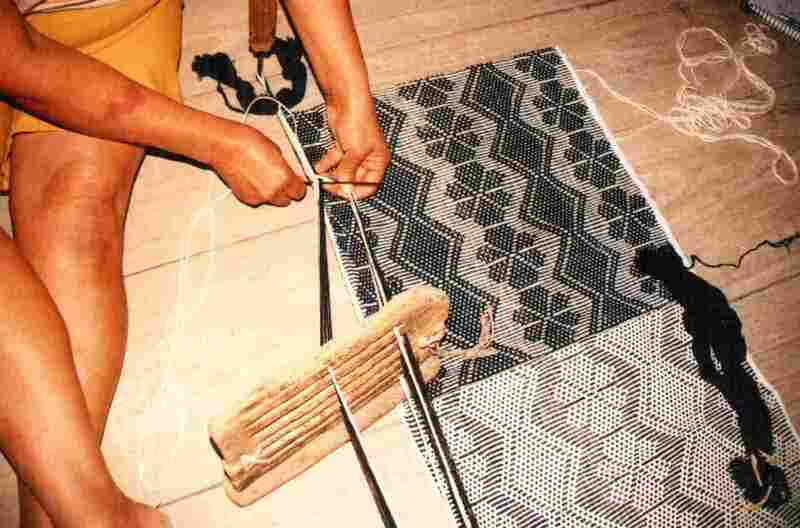 As you can see, the band is woven and sewn simultaneously to the edge of the woven fabric using the weft as the sewing thread. The purpose of this band is to strengthen the edges. Above you can see the warp with its heddles and shed loop which is the set up that is typically used in Bolivia. The picture on the right shows a tubular band on the edge of my woven eye glass case. The band is generally woven in the same colors as the edge of the woven piece. The items that I have edged have been woven with 35 wpi cotton thread or wool of similar weight and I have used this same thread for the tubular band. I have used 16, 18 and 24 ends and find that 16 ends make the nicest band. Experiment with your yarn and see what you like best. I recommend using a 24 wpi thread or heavier for your first attempts at this technique. These bands need to be sewn to STURDY material. These instructions are based on the way I was taught in Potosi Bolivia. Wind a warp of 16 ends. I have made a single color warp for this tutorial. You could make your band more decorative by adding stripes. Make your string heddles and add the shed loop either on the warping board itself or with the warp tensioned on your backstrap loom.. Thread your needle with a length of weft. Pass the needle from the inside of your woven bag to the outside emerging at the point at which you wish your band to start. The most important thing to note is that your weft will not be passing back and forth across the warp as it normally would when weaving a band. The weft will always pass in one direction only. The weft is carried on a needle (I use a long tapestry needle) through the shed from left to right as shown below. Have the far end of your warp attached to a fixed point. The near end will be held under tension with the forefinger of your left hand in the open shed and the rest of your left hand gripping the fabric. You will not be using your backstrap. Pass the needle with its weft through the end loops of your warp from left to right and secure the warp to your woven piece with a stitch. Pass the weft through the same shed again and secure with another stitch. Leave the forefinger of your left hand in the shed along with the weft. End with your needle ready to pass from left to right through the next shed. With all this in mind, take a look at the first weaver in this video as she opens her shed and passes the needle. The other parts of this video are not relevant to this tutorial. I am using 24wpi thread for this tutorial. After having secured the band to the fabric, open the shed loop, draw the warps down to the weaving line and beat using your finger/s. Pass the weft on the needle from left to right through the shed. Pull it tight. RIGHT: Open the heddle shed and draw the warps down to the weaving line. I use two fingers of my right hand as my sword and beater. LEFT: Remove your left forefinger from the old shed and beat. Then place your left forefinger into the new shed. RIGHT: Reach through the shed as shown above and pull the needle and its weft through the fabric and then through the shed from left to right. LEFT: Draw the weft all the way through the shed and pull it tight. RIGHT: Leaving your forefinger in the shed, pierce the fabric with the needle once again “parking” it in this position so that you can open the next shed. Anchor the weft with your thumb. Now take a look at all these moves together in this video. As for length of warp and weft….I have only ever edged small pieces. I wind my standard 36″ warp and use a weft strand that is a bit longer than that. I always have both warp and weft left over but better to have extra than not enough, right? Edited to add after having edged some large pieces: For large pieces, I measure the perimeter of the piece and add on 50%. It is much more than you need but this ensures that you have a comfortable amount of working space right until you stop sewing. It prevents being squashed up at the end of your warp desperately trying to squeeze in another inch of tubular band to finish. You need to get creative when you have reached the end of your edging. You will have a raw woven edge to deal with and my teacher would just sew over and over in a way to have the ends well secured and then she would cut the warp. The finish would look like a kind of knob. There was no science or technique to it! To see how my Guarani friend finishes, read the tips below. 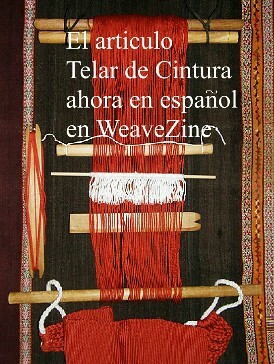 In the second part of the video which starts with the Bolivian weaver, above, you will see a Peruvian weaver weaving and sewing a tubular band which is patterned with picked and diverted warps. Her band is secured to her waist by way of a string that was passed through the end loops of her band’s warp. You can see that she clearly needs two free hands to make the patterning manipulations on her warp. You might feel that you would like to have your band secured to your waist as well. That’s a matter of personal preference. I recommend practicing this band many times on pieces of scrap sturdy fabric using 24 wpi thread or heavier before attempting it on your woven pieces. Become completely proficient at edging selvedges before attemtping to use this to stabilize a raw edge. I always dab a raw edge with diluted white glue or a stop fray product, allowing it to completely dry, before attempting to attach a tubular band. The tubular band will seem weird at first because the warp end is not secured to your body. You are used to having it on a loom bar or tied to you. If you are not comfortable with tensioning the warp with your finger, you can always pass string through the end loops and tie that around your waist. For the first few weft passes on your fabric edge you may have to pull and adjust individual warps into line to give you a clean fell line and even out any bumpiness. Decide exactly where you are going to pierce the fabric with the needle (how far away from the edge) and try to stick to that, for example, three warps in from the edge. Check both sides of the fabric to make sure that the band is sitting well on the edge and not too much to just one side. 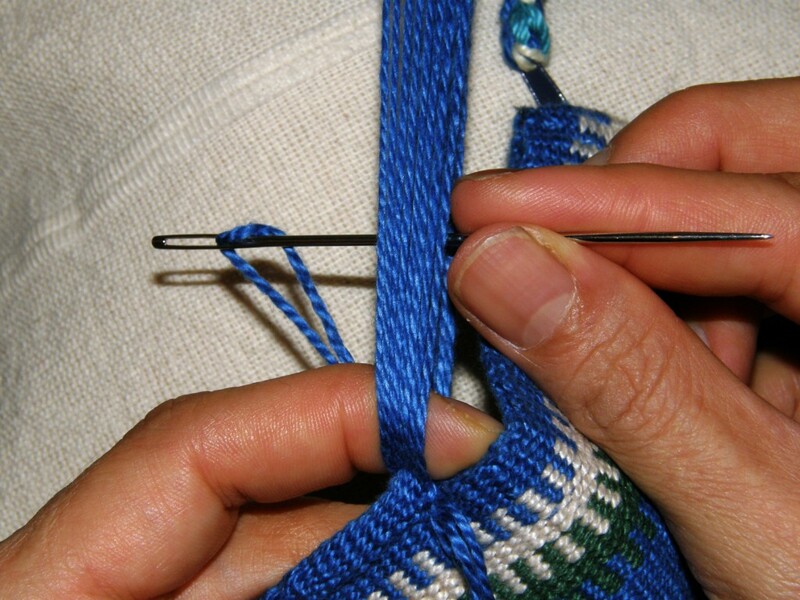 Make sure your needle is passing straight though the cloth and not down at an angle. Keep an eye out for buckling fabric. This is a sign that you may be piercing the fabric too far forward. If your band is looking more like a flat band than a tube, you are probably piercing the cloth with the needle too far away from the edge. If the tubular band feels hollow and looks like it wants to twist, you are probably sewing it too close to the edge. A tip for finishing: My Guarani friend edges small bags. She finishes the tubular band at the top of the body of the bag. Once she can’t sew any further, she weaves the band flat, passing the weft back and forth for about 5 passes as for a normal woven band without sewing. She then folds this flat piece of band over the edge of the bag to the inside and sews it there. Then she cuts the warp ends and they remain inside the bag out of sight. If you just want to weave a tubular band in cotton and not sew it to fabric, you will have more success using more warp ends. I suggest around 24 ends. I have made nice tubular bands that are not sewn to edges in heavy-ish wool using just 20 ends. A TUTORIAL ON HOW TO CUT YOUR WOVEN FABRIC AND SHAPE IT FOR AN ATTRACTVE BAG FLAP IS HERE. IT SHOWS HOW TO SECURE THE CUT EDGE SO THAT YOU CAN THEN COVER AND PROTECT IT WITH A TUBULAR BAND. Nice tutorial Laverne, Thank you for sharing your tips and videos. I am so appreciative of all the work you have put into your web site and that you share this information so freely. 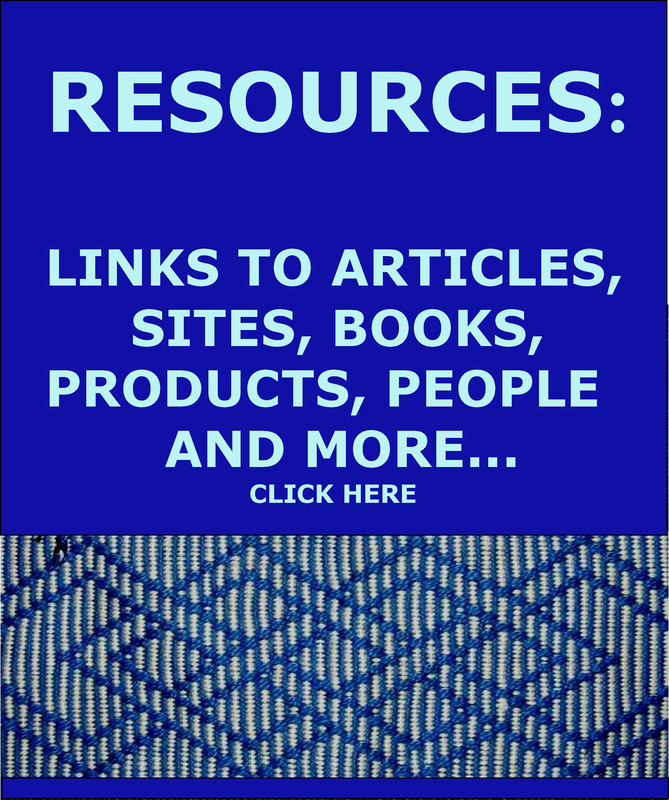 I live in a very remote area in central Alaska and do not have access to other spinner/weavers and ordering books and videos by mail is not financially practical, so I have had to muddle along on my own until I found your site. 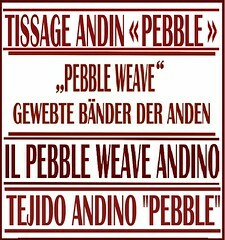 I did get your e-book on pebble weaving and have learned more than I could have hoped. again thank you. Hi Paula, well you know that I know how you feel after my experience living at the bottom of the world in Punta Arenas. 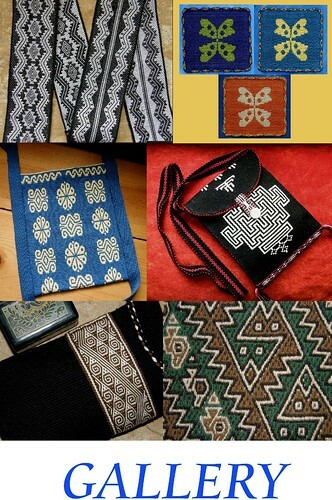 I am glad you found the blog and are getting along with your weaving. I am glad that you are finding the tutorials useful. I am not sure what you mean about the video. I just checked and it is still there. Can you not see it? Thank You for your clear tutorial. I am planning a trip to Peru in the fall and will try to see this being done. Are you going to the Tinkuy this fall? If so, you will definitely see tubular bands being woven! As far as beginning and ending… the warp could be temporarily knotted about 4 inches from the beginning of the weaving of the tubular band and then go up one side of the bag (both edges seamed together) and around the curve, then down the other side (both edges seamed together) and finish the warp with a wrapped or overhand knot. Trim beginning and ending of the warp as a tassel or pompon or embellish with beads. Maybe a little traditional but probably more attractive than a bump. I am digging around in my stash for things to weave a band onto. You always make me itch to start a new project.